Geoffrey Dearmer, who had left Oxford earlier in the year, enlisted in August 1914, and was commissioned as a second lieutenant in the 2nd battalion (Royal Fusiliers) of the London regiment on 25 September 1914. In July 1915 he learned that his mother had died of enteric fever at Kragujevac in Serbia while serving as an orderly with an ambulance unit. In October 1915, just days before he himself landed in the Dardanelles, his younger brother was killed at Suvla Bay in the Dardanelles by a shell that landed right on his tent. 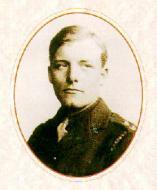 Dearmer himself survived that campaign, and then served on the western front. In August 1916 he was transferred to the Army Service Corps, responsible for organising supplies to the front. And with a gesture hid your darkening eyes. I turned ; and saw my Brother standing there. I saw wounds in his hands, his feet, his side. And needless horror of the Dardanelles. Still dreams of phantom battles in the bay. Of blinding shrapnel scattered from the sky. My information comes from Mark Bostridge’s entry in the Oxford Dictionary of National Biography; the volume of poetry can be found online.